Editor’s Note: The following article is based on a recent episode of OpenView’s BUILD podcast. You can listen to the full episode featuring Dave Grow, President and COO of Lucidchart here. Lucidchart may be the poster child for doing (way) more with less. This visual productivity platform has not only scaled to 10 million users (an impressive achievement in itself), they have bootstrapped their growth all the way. In fact, even after their rampant success helped them raise a hefty round of funding, they didn’t need to spend it. How’s that for efficient? I recently had the opportunity to sit down with Dave Grow, Lucidchart’s President and COO. He walked me through his team’s approach to delivering stellar sales and marketing results while keeping spend low. The team’s multi-level strategy adapted to the company’s growth and evolving objectives, allowing them to take advantage of whatever strengths and leverage they had at each stage along the way. Dave came to Lucidchart by way of his own SaaS startup and a stint in consulting. While he was still in school, he raised a pre-seed round for a niche product idea he had, but ended up running out of funds before he could establish a viable business. Realizing he might not be quite ready to build a business from scratch, he shifted gears and took a job with Bain & Company. After honing his business fundamentals with the firm, Dave was more than ready when Karl Sun, Lucidchart CEO, invited him to join the team in Utah. With his objective clearly identified, Dave’s next challenge was figuring out the best strategy to reach his goal. He quickly realized that there wouldn’t be much of a marketing budget. “We’ve always been a product-first company. It’s in our DNA,” he says. 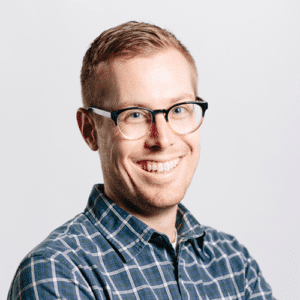 “If we had the means to support additional investment, it usually came in the form of another engineer who could help accelerate our product vision.” So, from the start, Dave’s primary marketing resources were his own time and his willingness to hustle. Based on this, he took a scrappy approach of fast, down-and-dirty experimentation to identify the most efficient ways to get Lucidchart in front of a lot of people. Ultimately, he decided to focus on SEO, a channel he knew something about and one that was designed to drive traffic to the top of the funnel. With his foundational sales and marketing strategy in place, the next part of Dave’s plan was to begin optimizing against that activity. For this stage, he has two key pieces of advice: focus on what’s working and invest in data you can trust. Dave recommends spending 80 – 90% of your time working in whichever channels are the best fit for your business, wringing out every last drop of their potential. In Dave’s case, working with SEO, he started by focusing on low-funnel keywords with high purchase intent. Once he had established content and ranking for that set of keywords, he started moving up the funnel and adding other tiers of keywords and phrases, all the way up to broad search terms like “what is an org chart?” in order to maximize every SEO opportunity. “We are now seven years into this effort, and we still haven’t exhausted the opportunities within this one channel,” Dave says. At some point, it will be time to branch out into other channels. You may be spending 80 – 90% of your time and energy in the one or two channels that are giving you the best return on investment, but that still leaves 10 – 20% of your time to experiment with new opportunities. You want to stay true to what’s working, but also engage in consistent experimentation on the side so that you’re ready to identify and layer on the ‘next big thing’. “You don’t want to get to the point where you’re cresting, where you’ve tapped out a channel, and not know where to go next,” Dave says. In other words, stay one step ahead. At the same time, it’s important to stay the course in terms of taking a focused and cost-effective path. As you reach certain growth milestones, you may feel some pressure to increase spending – especially as you prepare to move into new channels – but that’s not always the best choice. Lucidchart’s product led, capital-efficient approach has served them well because they stay committed to it. They maintain an active, behind-the-scenes conversation about where and when to invest in new opportunities, but they don’t spend just because they can. After a while, Dave had a pretty solid go-to-market strategy in place, and then everything started to change. After a few years of complete focus on a freemium, self-serve approach, Lucidchart began getting inbound requests from enterprise-size companies that wanted to roll the product out broadly. At first, these inquiries were handed off to a member of the executive team who would manage the sales process as an ad hoc event. But as the number and frequency of incoming requests increased and the scale of the deals also grew, the team knew it was time to expand the business in a new direction. “To start, we did what we always do, we experimented,” Dave says. “Instead of going out and hiring twenty people, we put one incredibly smart, talented, and strategic person on this with the assignment to figure out the opportunity.” What followed was a series of tests and a lot of phone calls with the inquiring companies. Lucidchart started closing some of the largest deals in the company’s history, providing some valuable proof points that supported going after the enterprise market segment with more vigor. “We’ve always felt strongly that we want to be in control of our own destiny,” Dave says. “We want to always be in a position where we can do right by our employees and our customers. We never want to put ourselves in a position where our fate is dependent on that next round of funding.” Dave’s philosophy was certainly shaped by his own early experiences in the software industry. Coming out of college in 2008 just as the great recession hit, he saw many friends lose their jobs as companies went under. He never wants to see Lucidchart in those dire straits, so he’s always careful to have a plan to help the company weather any storms that may come, and that includes running a tight ship that allows for autonomy.